When you’re looking for a large sedan that can be the right one for you to have a great daily drive on the road, the 2019 Chrysler 300 gives you something you want to enjoy. This is one of the only models on the market that has RWD in this class. This means the Chrysler 300 feels like it’s a gorgeous vehicle that can be fun for you to drive and that gives you the personality you’re looking for. Most of the time, we think we need to have a luxury model in order to enjoy what RWD has to offer. If you’re ready to drive a sedan that comes from a brand that you’ve admired for a long time, this big and sinister model can be right for you. The Chrysler 300 has a lot of power, the handling the makes a lot of sense for you, a ton of technology, and a slew of safety items. The interior is perfectly crafted to be something that feels like a luxury vehicle when you get behind the wheel. You’ll be glad to have this car as the one you drive, especially on long road trips with the family. 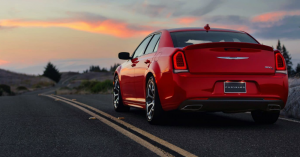 The 2019 model year gives us a lot of new vehicles to admire, but the Chrysler 300 is a car that comes in mostly unchanged. You’re going to love the comfortable, quiet, and powerful feeling of this car when you get behind the wheel. The smooth acceleration feels precise and right for the drive. Check out the amazing list of features and technology offered that will ensure you stay connected, safe, and comfortable when you drive. You’re going to be pleased with what you’ve found when you take this sedan home today. Start at the Chrysler 300 Touring trim and you’ll have dual-zone climate controls, an eight-way power driver’s seat, keyless entry, a leather-wrapped steering wheel, a split-folding rear seat, 17-inch wheel, a six-speaker audio system, USB input, and Bluetooth streaming. Move up to the higher trims and you’ll have a rearview camera, a panoramic sunroof, leather upholstery, heated and cooled front seats, a tilt/telescoping steering wheel, a navigation system, and a power-operated sunshade. You can have the upgraded 8.4-inch touchscreen display with the Uconnect infotainment system for you to enjoy the connection you desire. There are several options and packages you can enjoy in the 2019 Chrysler 300. This is a car that gives you an upgraded audio system that has 19 speakers from Harman/Kardon. You can add adaptive cruise control, blind spot monitoring, forward collision warning, and lane departure warning to the mix. The controls can be enhanced with AWD and you can enjoy upgrades to the interior and exterior to give you the appearance you want and the comfort that will make you happy when you drive. The standard power level for the Chrysler 300 is the 3.6-liter Pentastar V6 engine that makes 300 horsepower and 264 lb.-ft. of torque for you to have the drive you desire. If you want more power, you can have the 5.7-liter Hemi V8 engine that makes 363 horsepower and 394 lb.-ft. of torque to give you more of the power you’re looking for. Both engines that you can enjoy in this car are both attached to an eight-speed automatic transmission to give you the shifting performance that you want to enjoy when you drive. The Chrysler name is one you’ve loved and admired for a long time. The 2019 Chrysler 300 is offered to give you the large sedan and the power you want when you head out on the road and experience a fantastic ride. Visit your nearby Chrysler dealership and see what this elegant and large sedan can be for you when you’re looking for a car that can be right for you to enjoy on the road. One test drive is all it will take to convince you that you need to take this car home and drive it every day.